Travelers will find that Kyrgyzstan is a true melting pot. More than 80 different ethnic groups and nationalities live in this now presidential democratic republic, formerly a republic of the Soviet Union. 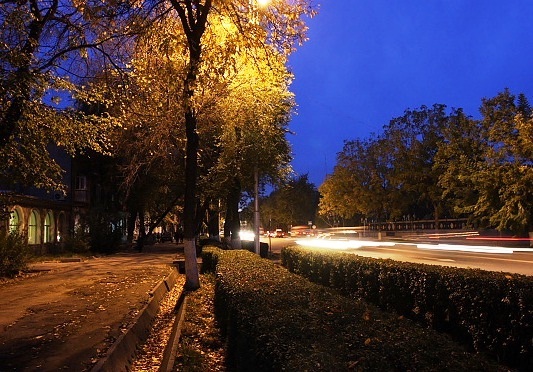 Total population is about five million, with one million in its capital of Bishkek. 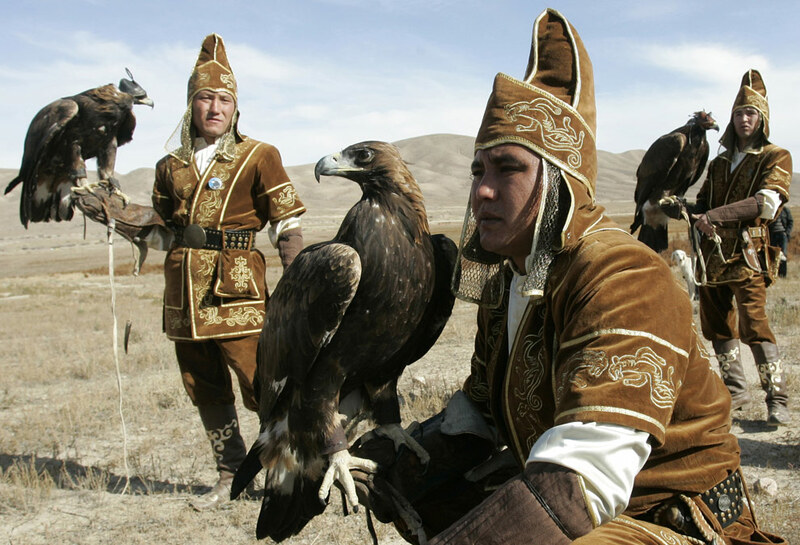 The originally nomadic group, the Kyrgyz, constitute a little over 50 per cent of the population with the other two major groups being Uzbek and Russian. You may wish to learn a few basic Russian terms, as English is still not widely spoken in Kyrgyzstan. Cyrillic is the main written language, but the symbols can become easily recognized. You should be able to wend your way to a restaurant in no time! This land of legendary mountain peaks that the nomads trekked across is a prime spot for backpackers and anyone wishing a breathtaking valley view. Take your camera and share your woodland orchard, lake, and mountain views with the world! Experience stunning Russian Orthodox architecture and sit at a friendly inn table groaning with pleasure from mouthwatering meat delicacies. View ancient minarets and stay in a traditional yurt in a village of warmhearted people. Go to a lively bazaar where kiosks offer staples and hand fashioned crafts and clothing to suit every individual taste. Kyrgyzstan is located in Central Asia. It is bordered by Kazakhstan on the north, Tadjikistan to the south, China on the south and southeast, and Uzbekistan to the west. The region is mountainous, with amazing panoramas and outstanding hiking opportunities. 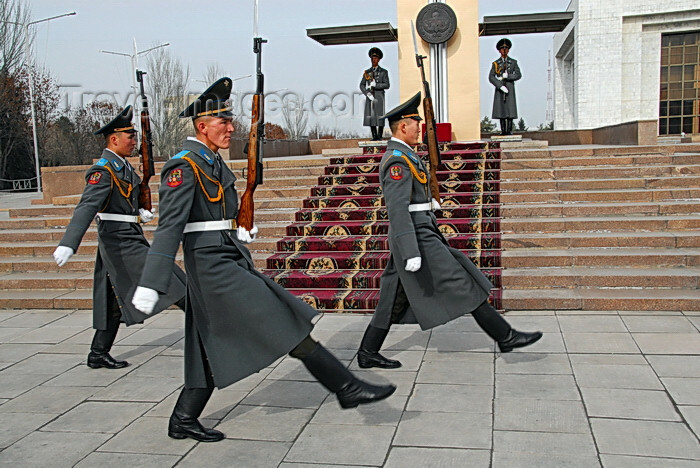 Travelers to Kyrgyzstan will want to immerse themselves in the rich culture of the capital city of Bishkek. This busy city features dramatic Soviet influence in architecture as well as entertainment such as theater and ballet. This thriving metropolis is easy to get around, with an extensive trolley and minibus system. Kyrgyzstan is also the home of the second largest mountain lake in the world, Issyk Kul. It is also the fifth deepest lake. In 1994, the lake was declared as "property of the nation" and at one time, it was forbidden to even swim there. Issyk Kul is a location of great beauty and a spectacular opportunity for photographers, with its surrounding mountain peaks and breathtaking valleys. There are many beaches, hotels, inns, and sanatoria, some featuring mud baths and hydrothermal springs. The Barana Tower, an eleventh century minaret, is another main attraction of Kyrgyzstan. It is regarded as one of the earliest buildings known of its type in Central Asia. The Barana Tower was excavated along with many Moslem religious buildings and mausoleums as part of the legacy of a devastating fifteenth century earthquake. Arslanbob is a far reaching landscape of woodland, in the valley of the Arslanbob River. Acres of fruit and nut trees grow abundantly throughout the land farther than the eye can see. Alexander the Great once took his troops to this land and legend has it that this is where he completed his eastern campaign. Alexander took fruits and nuts from these forests back with him to Greece. This is how the walnuts from these mountains became introduced to Greece, later becoming known as "the Greek Nut." Every year, 5000 tons of apples are harvested at Arslanbob, along with cherry plums, pistachios, and 1500 tons of walnuts. It's no wonder that this rich natural gift is protected by the state. 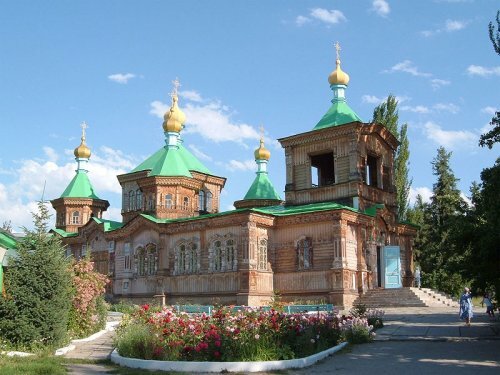 Although Kyrgyzstan is predominantly a Moslem country, the second largest religious group is Russian Orthodox, and there is much of the Russian heritage and Soviet architecture featured here. Marketing involves picturesque kiosks and colorful bazaars that travelers are sure to find fascinating. Carnivores will absolutely delight in the foods of Kyrgyzstan, as they are heavily centered around meat. The main dish of the country is besh barmak. This consists of a slaughtered and boiled sheep or horse. The first course served from this boiling pot is a soup made from the broth. Then the meat is divided among guests according to their social status, with head and eyes saved for special guests. Traditionally, after those of higher status have been served, the rest is mixed with noodles and sometimes onions, then served from a common dish. Although besh barmak is now normally eaten from the common dish with utensils, historically the community ate this with their hands. There is almost always a round bread known as lepeshka served with every Kyrgyz meal, along with green or black tea. This bread is meant to be torn apart and served by one party at the table. Many of the dishes involve pilafs or noodles with various types of meat mixed in. Vegetables are not usually predominant, but when they appear they are often highly spiced. Shishkebab, called shashlik in Kyrgyzstan, is also a popular dish, made with pork, beef, or mutton. Usually the shashlik is served with fresh onions and vinegar as a side dish. Traditionally, a prayer is offered following meals, but visitors should not be surprised to see a quick hand swiped over the face in lieu of a verbal prayer. Travelers should follow the lead of the host or hostess in this regard, in order to show respect. Vodka and tea are the two staple beverages of most of the Kyrgyz residents. However, visitors will probably want to try the fermented horse mare's milk called Kumys. Although this is a somewhat sour drink, it will no doubt be offered at some point and you will wish to experience tasting it. Most of the populace will tout dynamic health benefits to this traditional beverage, and who's to say?